Optional ramps are constructed with standard asphalt package so scales can be used on asphalt or concrete. Note: 770-AW Axle Weighers, 770-AW-LG Landing Gear Scale and 770-AW ramps sold seperately. Note: Cambridge offers a full line of indicators for your weighing needs. Cambridge Scale Works, Inc. has designed our Model 770-AW Series with unique “drop-in-place” modules and convenient alignment mounting pins for easier installation. 4” structural tubular steel cross-strut design equally distributes weight over entire scale surface for superior strength and durability. 20K “Heavy Duty” environmentally sealed load cells. Each module is independently wired at the factory for quick and easy installation. The polycarbonate NEMA IV junction boxes are prewired and only require a single signal cable from one of the boxes to the indicator. 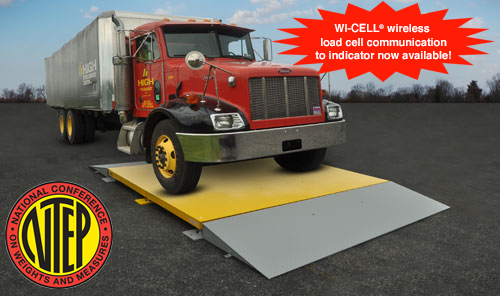 Optional ramp has an asphalt package and locator plates.The asphalt package supports the scale on asphalt and protects the scale from settling. The locator plate properly aligns the ramp and scale and supplies proper clearance for operation. Model Size Capacity CLC # of Modules # of Load Cells Load Cell Capacity Est. Ship Wt. 770-AW 10′ X 8′ X 5″ 60,000 lbs. 40K 2 6 20K 2,850 lbs. 770-AW 10′ X 10′ X 5″ 60,000 lbs. 40K 2 6 20K 3,550 lbs. 770-AW 10′ X 12′ X 5″ 60,000 lbs. 40K 2 6 20K 4,450 lbs. 770-AW 10′ X 15′ X 6″ 60,000 lbs. 40K 3 8 20K 5,325 lbs. 770-AW 10′ X 18′ X 6″ 60,000 lbs. 40K 3 8 20K 6,675 lbs. 770-AW 10′ X 24′ X 6″ 60,000 lbs. 40K 4 10 20K 8,950 lbs. 770-AW 10′ X 30′ X 6″ 60,000 lbs. 40K 5 12 20K 11,200 lbs. Model Size Capacity CLC # of Load Cells Load Cell Capacity Est. Ship Wt. 770-AW-LG 10′ X 3′ X 6″ 60,000 lbs. 40K 4 20K 1,200 lbs. Model Size Capacity Est. Ship Wt. 770-AW RAMP 10′ X 3′ X 6″ 60,000 lbs. 895 lbs. 770-AW RAMP 10′ X 5′ X 6″ 60,000 lbs. 1,000 lbs. 770-AW SPACER 10′ X 5′ X 6″ 60,000 lbs. 1,100 lbs.